This entry was written by Sarah Jenkins, posted on 08/11/2015 at 11:54 pm, filed under Youth 2015 Tour category. Today we were witness to the passion of the Christ as we retraced His steps from arrest to crucifixion to His resurrection three days later. Our incredible day begins with the Mount of Olives. We get an early morning view of the Temple Mount and the city of Jerusalem – this is essentially the postcard shot of the city. It’s a spectacular sight and we take many pictures. Yuval gives us an overview, sharing the history of the successive temples as well as the Prophecy about the Golden Gate. Prophesy says that says the Messiah will walk though that gate when He arrives, and that the gate will remain closed until that time. Yuval also points out that the mountain we are standing on is where Jesus ascended into Heaven, and where He will return. Before we can go any further we are distracted by a camel. His owner, an Arab man who has been hustling camel rides from torist for years, calls him Kojak. He’s a clearly a decent guy trying to make a living in East Jerusalem and so we obliged him. Students and parents alike enjoy some fun in the back of a camel. After everyone has had thier turn, we begin our walk down the Mount of Olives. This is the path that Jesus would have taken. The new road follows the old one, and we walk this very steep path carefully. Incredibly, cars drive up and down the mountain via this road – some carrying fatigued pedestrians. We stop midway down the mountain at Dominos Flaviet – this is the tradition site of Jesus weeping over the city. It certainly would have been a good place as it provides a splendid view of the Temple Mount. A basilica marks the spot, shaped in the form of a tear drop. There are tombs here, and Yuval takes some time to explain a bit about the burial customs on the ancients. We continue down the Mount of Olives and see graves that now cover most of the mountain. This has been a place of burial for centuries. We reach the base of the mount and are now at the Garden of Gethsemane. We vist the Church of All Nations briefly before entering a private section that has been reserved for our group. It gives us an opportunity to talk about Jesus’ prayers in this place. Pastor Aker leads in the devotional, afterwards everyone is invited to go out the garden to pray. It was a significant time for the students. After the garden, we go up to the House of Ciaphas, the high priest at the time of Jesus. We find the church that is built over the spot almost vacant – it’s usually packed with pilgrims. We are able to take our time as Yuval leads us through the church, pointing out the archeology that gives us a better understanding of Jesus and His trial before Ciaphas. We discover the pit that was used to detain prisoners. It was basically a hole in the ground that prisoners were lowers into and abandoned in the dark. Pastor Aker read from Psalm 88, and we tried to imagine Jesus beaten and lowered into this pit in the dark as his captors debate his fate and as his followers have fled. Peter is up above him in the courtyard, denying that He even knew who He was. 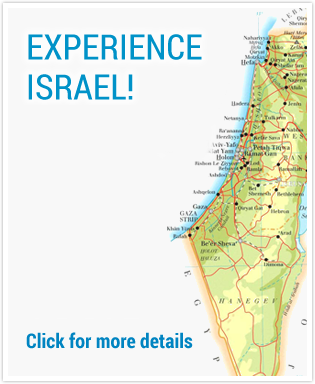 Our plan is to continue to walk in the footsteps of Jesus, but next we will visit the Israeli museum to look at a model of the city of Jerusalem. This model city helps us better understand the sites we have visited, and the path that Jesus traveled through the city. We have lunch at a little strip mall by the road side. It’s a favorite of our visits here – they serve very good schwarma. Schwarma is a sandwich of chicken and turkey along with hummus and salad and fries all wrapped up in one big pita pocket. It’s delicious. After lunch we resume our journey into the arrest, trial, and crucifixion of Jesus. We walk into the Old City again, this time crime by St. Stephen’s Gate. We enter the Arab quarter and walk to the Pool of Bethesda, where Jesus healed the crippled man. In addition to being an impressive ruin, the site also hosts St. Mary’s Chapel – a church with amazing acoustics. Only a short walk away, we enter Antonia’s Fortress, were Jesus stood before Pontious Pilot. Some of the original pavement from the time of Christ survives here – it’s a powerful site. Though no longer open to the air as it would have been in the time of Christ, it is easy to feel the weight of the history and emotion embedded here. We began our walk all the way to Golgotha, or Calvary, tracing Jesus’ steps along the Via Dolorosa and then out of the Damascus Gate, along the streets of East Jerusalem to the garden tomb. 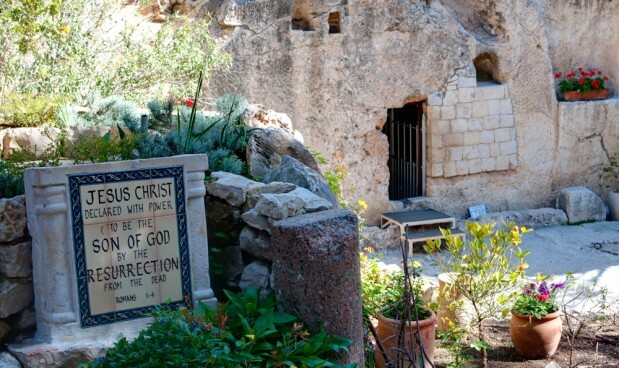 Although we cannot be sure that this is the exact tomb where Christ was laid, many signs point to it being a good contender. The site is beautiful, and the emotion of being able to step into an empty tomb is overwhelming. He is not there – He is risen indeed!